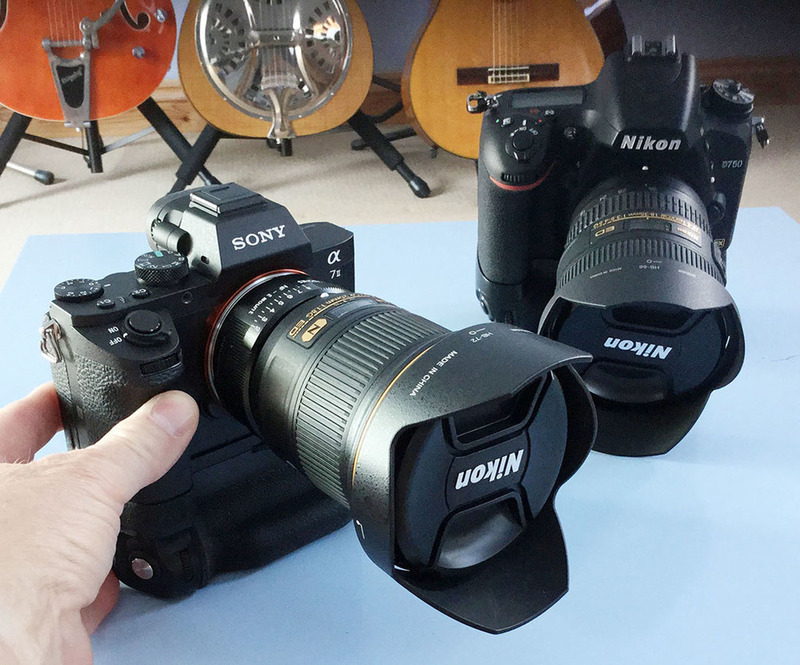 The Sony A7 II looks like a DSLR and performs like a DSLR, so I thought I'd have a look at how it performs against the real thing, a Nikon D750. Aha you say, the first advantage is it's smaller and lighter. Well yes as you can see that is indeed the case, but I've weighed these with the battery grips for a reason. The Sony A7 II with it's 2x battery grip is capable of around 600 shots as my A7 II only shoots around 300 images before it needs another battery. However the D750 averages around 1200 shots per battery i.e. 4X as much. So a Nikon D750 without battery grip can shoot approximately 1200 images and a Sony A7 II can shoot approximately 600 images WITH its battery grip. The battery grip I have on the Nikon weighs 200g, so once you take away this plus the weight of one battery the D750 camera body is slightly lighter for double the power. So not exactly much of an advantage to the Sony. Lets look at image quality. Here are my quick test comparisons. The Nikon image is on the left. This link - https://photographylife.com/reviews/sony-a7-ii/6 has a whole series of comparison tests between various cameras, including the A7 II v D750. As you can see from these tests, no advantage to the A7 II. In fact the reverse. AF speed - The Nikon D750 is faster and noticeably so. Startup speed from cold to image capture - Nikon 1 sec. Sony 4 secs. Lens range - no contest. Nikon has hundreds of 'full-frame' lenses available for the D750, Sony / Zeiss has a fraction of that available for the e-mount and even when you take a-mount lenses into consideration via an adapter, Nikon still wipes the floor with Sony. Manual Focus. Nikon has the brilliant rangefinder dot system that works in any light with any lens with no button pushing or need for magnification. Sony has the 'messy' focus peaking that requires setting up a function button to operate it and the need for a magnification screen, because focus peaking doesn't work without one. Video - Nikon has a really good set of usable options, Sony A7 II STILL has the amateurish AVCHD and 'stretched' 1440 x 1080 options. I've only used each camera to shoot video with a couple of times but for me the D750 footage is sharper and has better colour. Price - varies between dealers here in the UK, but currently if you shop around they are pretty much around the same price. So does the A7II actually have ANY advantages? Well yes it has IBIS and a larger buffer for raw files. The D750 is surprisingly limited in burst mode. So if those two things are important to you, then the A7 II finally has something over the Nikon. However the vast majority of the cameras and lenses I've used and owned haven't has IS, so it's not something I'll miss. Incidentally you might like to see this comparison over at Mirrorlessons to see how the Sony A7 II compares to the Olympus OM-D E-M5 II in terms of IBIS. And certainly I've been somewhat disappointed in terms of how the IBIS works with my Nikon lenses. It seems third party lenses aren't that well supported, which is somewhat different to the positive experiences I've had with the same lenses on my Olympus in terms of stabilisation, though the Olympus is way too slow and fiddly to actually operate it's focus peaking easily. SO HOW DO THE NIKON D750 AND SONY A7 II COMPARE FOR WHAT I DO? Well I imagine it's pretty obvious by now that the D750 is easily the more suitable camera for my requirements. For me in almost every way it's the superior camera. It's not quite as 'pro spec' as a D4 or D810 and indeed my Df is actually superior to it in terms of burst mode buffer and overall speed of operation. But for my requirements it's easily fast enough. And for what I do the better image quality, battery life and video all mean that it's a clear winner for me. I actually wish I'd bought the D750 before the A7 II as I would never have spent all that money on the Sony. As it is the A7 II will be going on ebay later today. And in essence this is what I keep writing about over and over again. MCE (Mirrorless / CSC / E.V.I.L) cameras still have to do a lot of catching up to do to DSLR's for real top end 'pro' performance. And the 'mirrorless myth' that DSLR's are dying, on their way out and being superseded by MCE's is exactly that, a myth and one perpetrated and talked up by MCE manufacturers and camera owners. In fact the latest sales figures I've seen show that there is the usual increase in interchangeable lens camera purchases around this time of year, but DSLR sales are actually rising more than MCE sales. For me, the Sony FE system is not something that I really want MCE cameras to be anyway. I thought I did but after giving it a good go I actually don't. Because I don't see much point in using MCE cameras and lenses that are only, in many cases, only marginally smaller and lighter in terms of size and weight, but don't match up in terms of performance to DSLR's. And that is pretty much the problem with 'full-frame' Sony FE MCE cameras. The Olympus OM-D E-M5 II for example with it's smaller form factor from the m4/3 sensor is much more what MCE is about for me. Apart from the fact that I like using it way more than the A7 II, it's a much more efficient camera and as I'm going to illustrate in a comparison in the near future with the D750, for me competes much better with the D750 than the Sony. In fact I would consider the Olympus to be more of a performance alternative to the Nikon than the Sony, which may sound strange. 'Full-Frame' 24MP sensor versus 16MP 4/3 sensor you might say, but the results I get from my Olympus for the work I do aren't really that different to the Nikon after careful processing from raw and upsizing at the low ISO settings I use. Plus as a competitor to the D750 it has the major advantage of the Sony, the IBIS and far fewer disadvantages. Though battery life is still an issue. And it really is getting to be a case of the 'Kings new clothes' with certain MCE cameras, which flatter to deceive. The manufacturers and owner / users like to talk them up and rubbish DSLR's at every opportunity, but these slap up mirror, supposedly old fashioned DSLR 'dinosaurs' still seem to get the job done better at almost every level. And I have to say over the last year or so, I've started to get seriously disillusioned with the direction of MCE, with a few notable exceptions and with their performance in general and Sony FE in particular. Maybe Sony and the rest of the MCE manufacturers will all get their act together and eventually achieve parity with DSLR's and maybe even supercede them. But based on current models there are no signs that is happening anytime soon. And yes there are smaller lighter MCE alternatives that turn in decent performance, but then there are now smaller lighter DSLR alternatives as well. *And Nikon in particular are slowly putting out a range of lighter high performance lenses as well. My 20mm f/1.8G and 18-35mm zooms weigh in at around 354g and 381g respectively and have stellar image quality, unlike Sony with their very mixed bag of e-mount lenses. Obviously people can buy and use what they want and for some the Sony FE system in general and the A7 II in particular ticks a lot of boxes. But it doesn't for me. I've already left Fuji X behind and I'm shortly going to be doing the same with Sony FE. I'm still enjoying my Olympus OM-D E-M5 II and getting superb results from it and of course the Leica T (Typ 701) is great, but when push comes to shove and I need a fast, reliable, high IQ camera that will handle absolutely anything I'll still reach for a Nikon DSLR. And the fact that I seem to have been doing that for decades and still doing it now indicates to me just how far mirrorless / MCE hasn't come in the last few years or indeed lived up to expectations in terms of high-end camera performance that can rival DSLR's. And how what seemed to be great promise hasn't materialised in terms of that performance and usability at the highest level. And as I've written many times this 'DSLRisation' takes away the genuine advantages of MCE cameras in general that I see and want i.e. the smaller footprint, which, as far as I'm concerned m4/3 still has, but systems like Sony FE don't, because of the lens size. But as I've written before these are only cameras, it's not as though they are anywhere near as important as the images I create with them, so in the end it's just my choice. Others may see it differently but for me the 'mirrorless revolution' hasn't really materialised as yet, at least not at this 'DSLR killer' top end of the interchangeable lens system cameras. It may still, but to be honest. I'm not holding my breath.